You can go to any liquor store, pick up some generic bottle of Syrah it will say “pair with grilled meats”. You read that enough times and something clicks. When you feel a craving coming, you take the necessary steps to calm the demons within. After living in Montreal for 3 years and being able to walk down the street to get world class smoked brisket, you need to take control of the situation for yourself. Some of you live in cities where you can just buy good smoked meat, whether from a cart, or a restaurant. When you live in Penticton, the is more of a DIY endeavour. I went to Tony’s Butcher shop in Penticton and ordered a brisket. This was surprisingly easy. I found some faux Montreal smoked meat recipe online (below) and went through the 4-day process. Create brine, submerge brisket, wait 3 days. Pat down brisket, seal the brisket with spice crust, put in the oven at 225F … waiting. Now the fun part, emerge from a 12-hour nap, remove from oven, steam the meat. Voila! Slow Roasted Brisket. The traditionalist in me always says rye bread. Grab a bag of generic Munich rye, or rye with caraway seeds, but the light German style is most traditional. You need yellow French’s mustard. Yes, it is probably our patriotic duty to buy Dijon mustard due to the famous Canadian mustard seeds that hail from Saskatchewan, but in this case, go with the processed yellow French’s mustard. You need pickles. For those that like a hearty crunch go with the half sours (more cucumber than pickle). I’m not the biggest fan, but dill pickles are important, you need two per plate to cut through the fattiness of the brisket. Lastly, the traditionalist also needs black cherry pop, Cott’s black cherry. 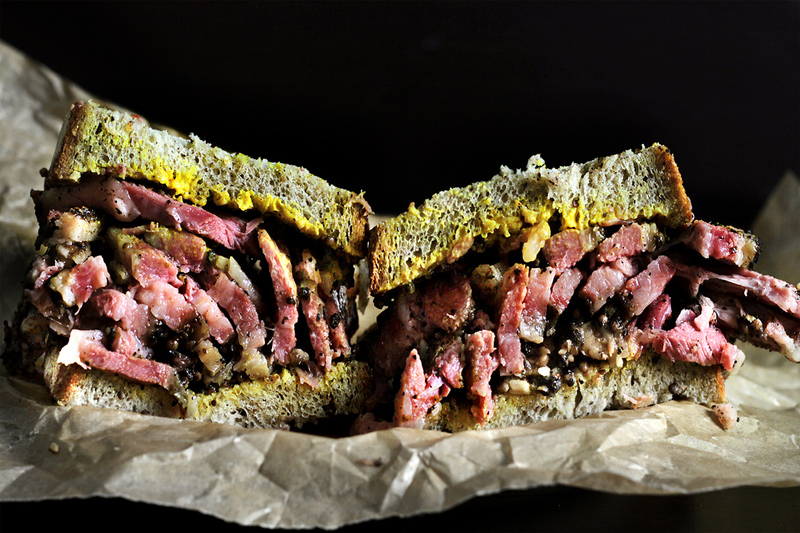 That will give you the full Montreal Smoked Meat experience. Mind you, if you’re doing this at home, you deserve a great glass of wine. A trio of Syrah: Violette, Classique, and Equinoxe is the perfect excuse to discuss the unique virtues of our different cuvees, but also see the progression of Syrah against your perfect brisket. Having 3 Syrahs open will also make sure that you have enough wine to not only entertain your guests but cleanse your palate between each bite.